Discussion in 'Dev Blog' started by mollygos, Feb 23, 2016. We've got a really busy month ahead! I mean, that's always the case, but apart from the usual dev work we've got all of the events coming up. Hope to see some of you at PC Gamer Weekender or Norwich Game Festival! I know they're UK-based -- hopefully we'll be able to attend more events all over the globe once 1.0 is released! Fair warning that you should expect to hear a bit less from us on the week of GDC, since we'll be well outside of our normal work hours and running around to various talks and meetings. 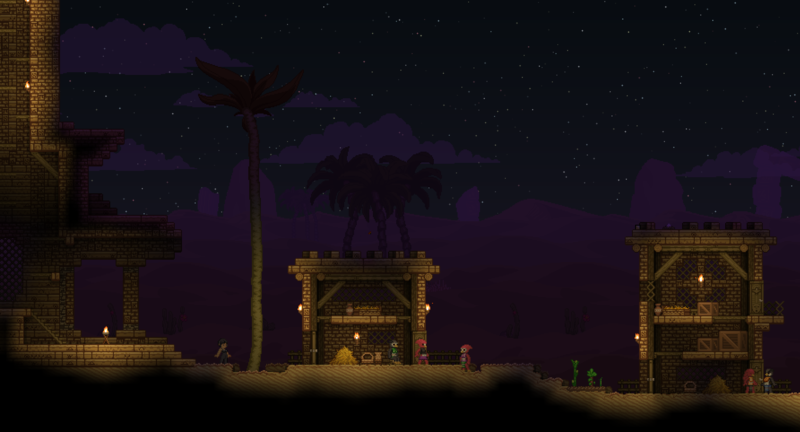 I'll keep you posted via @StarboundGame and @ChucklefishLTD on Twitter. This week we've got SamuriFerret, Healthire and GeorgeV working on various quests/missions, Necotho working on tier-specific dungeons, Rosiedeux and Lili working on polishing up the UI, Harriet is working on descriptions, Metadept working on Outpost upgrades and Supernorn and Tom working on backer rewards. Stardew Valley by ConcernedApe is coming out on Friday, too. Here's the latest trailer! And here's a little preview of an Avian village implemented by Necotho! Post your comments in this thread. Crossfang, Kitts2307, Tamorr and 9 others like this. Astrih Konnash, Spritley Jack and DaedricShadow like this. Do I see tillable sand? I may have to update Many Seeds, with this knowledge! Spritley Jack, Astrih Konnash, Kelthazan and 1 other person like this. I'm guessing this is a devout Kluex-worshipper village, what with the temple? Again, I hope this is in addition to the existing Grounded villages. I like the idea that the Grounded actually life in nicer, bigger homes and well-constructed while the devout are "encouraged" to live "humbly". Tazmaniac95, STCW262, Spritley Jack and 3 others like this. I still feel the dungeons are a bit 2 dimensional. Using background tiles to give a psuedo 3D appearance would go a long way. Aleserche, Phaetum, Tazmaniac95 and 21 others like this. Spritley Jack and Joft like this. That looks kinda nice... I need to agree with @M_Sipher on that this - like the new apex settlements - should not be a replacement, but rather an addition. Also definetley agree with @The | Suit on having pseudo-3D builds by use of the background. Spritley Jack, ApexCollective and Heartstrings like this. Yes, the background buildings are a must. Also woohoo birdpeople get more town variety. I love the design! I too also agree with pseudo-3D builds, especially in regards of using background tiles for buildings. probably mix and match the new apex settlement buildings, with the houses, apartments, stores, and more emphasis on the prisons as seperate structure underground. maybe even add towering buildings in the background. Besides the science labs, i never really got much of the high-tech, futuristic vibe of the apex outside of that. Did I just accidently make a Birds and Bees reference? Besides the science labs, i never really got much of the high-tech, futuristic vibe of the apex outside of that. Well, you wouldn't want to give the really nice stuff to the proletariat. Keep them in their little cubicles with just enough to pacify them. Then as I recall a "polish" update with a ton of fine-tuning and optimization and a handful more of new stuff before the complete, all-story-missions 1.0. Am I the only one thinking of Alien Ant Farm? No. Whoever came up with that thread title thought of it first, just for starters. I too thought of it when I saw it in my feedreader. And you won't be the only one to bring it up. If it is and that's one of those towers on the left I bet that means they spend a lot of time scrapping Avian off their roofs. Spritley Jack, Kawa and TheFloranChef like this. A perfect place for a restaurant. With the reduced cost (without the need to buy the main ingredient) the profit would be high. Aw :I I thought you said tiltable like we were getting slope blocks... I spent like five minutes staring at the sand. The new apex villages are so much more civilized and beautiful but these avian villages are the exact opposite.....so scrappy....makes me very sad.